The whole intent of a counterfeit is to fool people. Most of the time it’s done for monetary gain, but perhaps the sweetest counterfeit – in every sense of the word – is done to save money. It’s a counterfeit wedding cake. The idea might seem outrageous but it actually happens more often than people imagine. 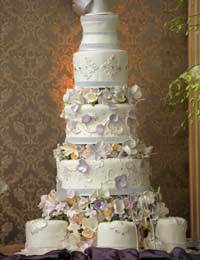 A large wedding cake can cost a great deal of money, and much of it can go to waste. It looks wonderful at the reception and everyone wants a piece, but there’s almost always so much left over that it can seem like an outrageous expense. Couples who are on a budget often opt for a counterfeit wedding cake. Properly done, as most of them are, it can be impossible to take them from the real thing until someone cuts into them. Only part of the cake is fake; there’s still enough real wedding cake to go round, but the pretence can shave large amounts off the costs. Although the idea began with couples who wanted the big wedding look but didn’t have too much money, the idea of the counterfeit wedding cake has become more widespread. It’s far more commonplace than many people imagine, as more people have realised that expensive wedding cake going to waste is pointless. The true splashes among weddings won’t cut corners, of course, but in many instances, no one’s the wiser if part of the cake is real or not – except the people paying for it and those making it. The fake wedding cake looks completely real. Indeed, all the icing and decoration is real. It’s the centre of several of the tiers (usually the lowest one, at least) that’s fake, usually made from Styrofoam that’s cut to shape. From there it’s decorated as any tier of the wedding cake would be and the whole thing is taken to the reception and assembled. The happy couple knows which layer to cut, and then the servers, who’ve been briefed, take over. By that time none of the guests are paying much attention to which parts of the cake are cut, as long as they receive a small slice. Sometime it can be the baker who suggests the counterfeit cake, knowing just how much money it can save. There are still some costs, of course, as decoration isn’t cheap. The less elaborate the decoration, the more a couple will save. There are even bakers who specialise in fake cakes for weddings. As an alternative, there are fake tiers that have what’s called Perma-icing, which is artificial and non-edible. This means that these cakes tiers can be re-used – the couple getting married simply rents the fake cake for the reception. This is the cheapest way to go for couples where money is tight but where they still want to put on a good show. Such as it is, the downside is that a fake wedding cake simply isn’t traditional. But when a wedding can cost many thousands of pounds, any way to shave off some of the costs is a good thing, and most couples don’t mind a break with tradition for a good cause. Beware, though; there have been instances where the baker has substituted fake tiers without the couple knowing until it was too late.